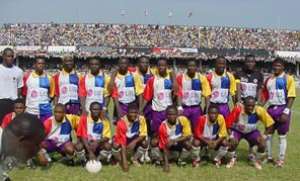 Accra, Jan.14, GNA - President John Agyekum Kufuor on Friday called on the Management and Playing body of Accra Hearts of Oak Sporting Club to endeavour to become the pace setters for the development of football in Ghana. He said that, "with the achievements made by the Club in recent years, it has a duty to improve football in Ghana". President Kufuor made the call when the Management and the Playing body presented the CAF Confederation Cup they won last Sunday to him at the Castle, Osu. Hearts Captain, Skipper Amankwah Mireku and Deputy Captain, Emmanuel Osei Kuffour supported by Mr Ato Ahwoi, Chairman of the Board of Directors and Mr Tommy Okine, Executive Chairman of the Club presented to Cup to President Kufuor. Hearts won the maiden CAF Confederation Cup 9-8 after a marathon penalty shoot out in the final leg match against archrivals, Kumasi Asante Kotoko at the Kumasi Sports Stadium. At the end of the two-leg matches played at the Accra and Kumasi Sports stadiums, both matches recorded 1-1 drawn results. President Kufuor said he was optimistic that other clubs and the National teams would follow suit as the Phobians assert their supremacy at both the local and the continental levels. He said, " I am proud and happy to receive a second trophy from Hearts. In 2001 you presented the Super Cup to me. This shows that perhaps there is some hidden relationships between the Club and President Kufuor, who is proving to be the lucky President to Hearts." "I am highly elated that the first CAF Confederation Cup is coming to Ghana and it is significant that it is coming through the Premier Club", he added. President Kufuor said Ghana has had a distinguished history in football on the African Continent but regretted that she did not now feature prominently to win more laurels for the country. "We are now recapturing this sunken image in football with Hearts winning the maiden CAF Confederation Cup. I am happy for Hearts to rekindle the spirit". He said with the two top Clubs in Ghana, Hearts and Kumasi Asante Kotoko competing for the maiden Cup in the finals, it is an indication that Ghana was still not lost in the game of football in Africa. President Kufuor called on the Management and the Playing body not to limit their prowess to the African Continent alone but to endeavour to extend such feats to the international level. He said Ghanaians expect Hearts to beat Enyimba Club of Nigeria to win the Super Cup to register Ghana firmly on the Continental football arena, adding that, "Ghana has produced many players for the world but no team has as yet ventured into the world scene." Mr Kwadwo Baah-Wiredu, Acting Minister of Education and Sports expressed appreciation to Hearts for their achievement. He said the competition between the two glamorous clubs in Ghana was a major achievement that will propel football in Ghana to greater heights.
" I am very happy with the behaviour of players from both teams on and off the field", he added. Dr Nyaho Nyaho-Tamakloe, Chairman of the Ghana Football Association (GFA) said " it is a great achievement for Hearts to win the Cup during his era and that of the New Patriotic Party (NPP) under President Kufuor".